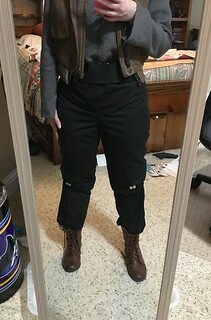 Finally decided to take the jump and create Jyn after wanting to since before the movie came out! 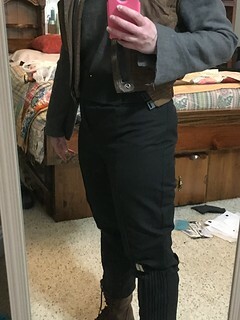 I plan on making the shirt (fabric already purchased after recommendation from the gals over at Stardust Sisters) and pants from scratch. 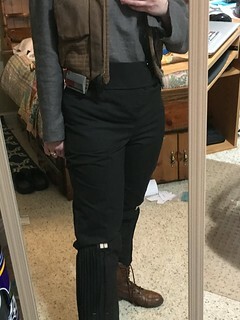 I’ve purchased the vest from a fellow Jyn that will need a little work (the quilting on the back). I’m really looking forward to getting this started and finished! Hi Robin! That is awesome. Looking forward to watching your build. Let us know if there's anything we can do to help you. How do I add pictures to my posts? I was using Photobucket but I thought I read that wouldn’t work now. Unfortunately, photobucket no longer works. I use Flickr, which is another free photohosting website. If you have a link to a photo, you can use the code (img)your URL goes here(/img). Replace the round brackets with square brackets ( [ instead of ( ). That should make the photo appear in the post. Another way to add a picture is to have your link copied, and click the "Img" button at the top of the text box, and it will put in the opening bracket. Paste your link. Click "img" again and it will close it. Now, if your image is larger than 500px wide, it will show up full size and make the build thread look wonky. 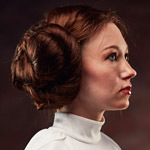 I always make a smaller version of the picture at 500px wide. So, to link to the larger picture, use the instructions to post the image of the smaller picture, and highlight the whole code. Click the "URL" button. Put your cursor behind the "url" code and add an =, then paste URL for larger picture. I hope that wasn't too confusing! Here is the mock up of my shirt (after a couple of attempts and with input from the ladies over on the Stardust Sisters FB page). And thanks for the help on how to post a picture ladies! I think you're on the right track so far. 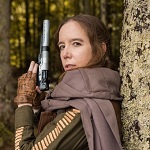 So here is Jyn's shirt put together. 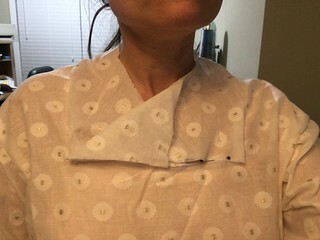 I have left the front of the collar loose until I'm sure everything looks okay. You shirt put together looks great so far. The shirt is looking pretty good so far! The collar shape is almost there... the underlap side should extend further over so the collar pieces overlap in the Center of your chest... I've made a picture. I ended mine maybe half an inch from the corner to reduce bulk. The only thing to watch out for is making sure your head can still fit through the collar. Okay. The pants. I have finished one of the legs (didn't want to have to seam rip them both if its wrong!). 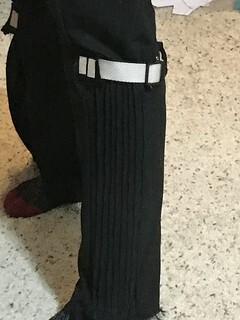 Its not hemmed yet but I wanted to see if the pintucks and strap looked okay. I think I need to taper a bit more down the leg. I think your pintucks look great. 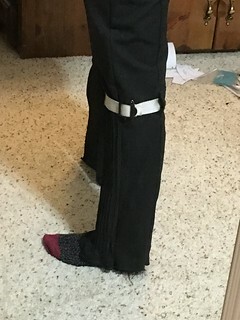 For whether to taper the pants, what would they look like with your boots? That's usually what I look at and use as my basis for figuring out how wide they should be. 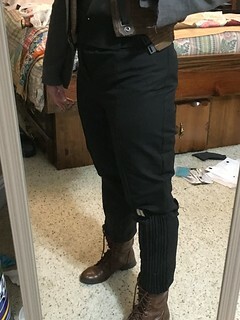 Here are some pictures of the pants with vest and boots. The waistband is only basted on (still fiddling with that). 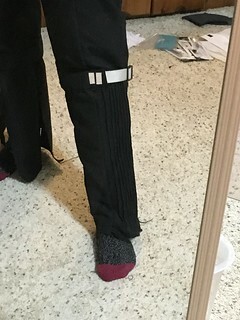 I have the bottom of the legs tucked up and I removed the straps while I was sewing. Thoughts? 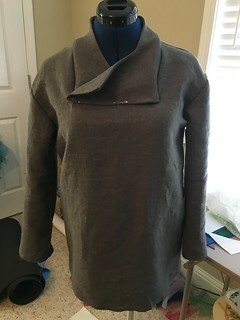 Second attempt at the back of the vest (first was not puffy enough). This has a layer of batting and a layer of the Flex-Foam stabilizer. Are the lines defined enough or should I try to add another layer of something? 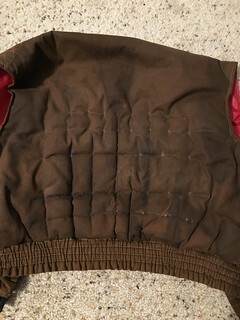 Vest - we're looking at the left half? That looks puffy enough to me. I can see the lines. Sorry it's taken me so long to respond to these!